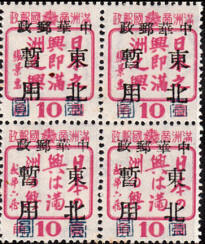 These are found on some early post-war stampless covers. 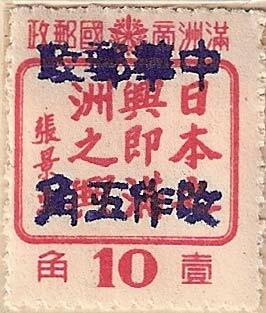 This reads 中華郵政 Chinese Post, 郵票另纳 Postage Paid , 鶴立 Ho Li. 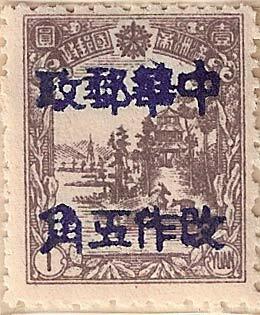 The earliest cover example I have seen of this is a black 8 character surcharge is March 1946. 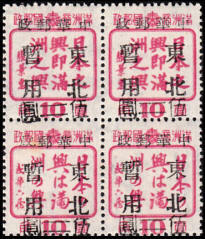 The top four characters read 中國郵政 Chinese Post followed by 50f (5 chiao) Temporary Use. 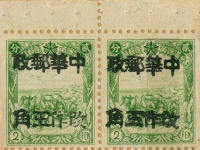 There are also 2f and 4f booklet panes to be found for this set. 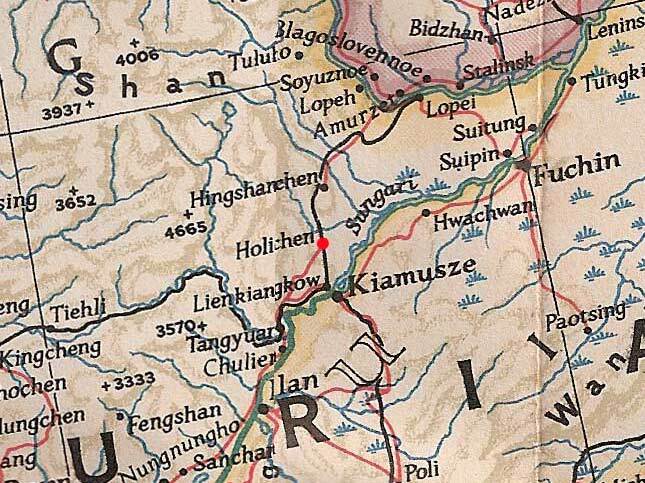 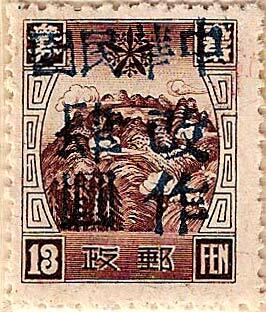 Note: This set also occurs on covers postmarked from Kerr 128 兩江口 Liang-chiang-k’ou although in my opinion based on old collection data is that these stamps originated from the Ho Li Post Office. 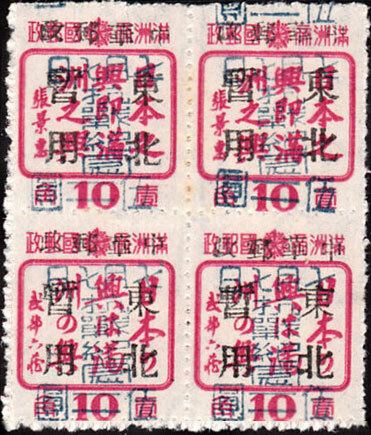 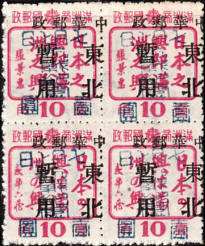 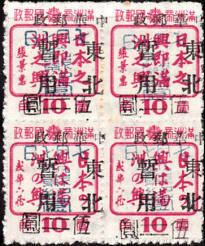 This is a hard blue 8 character surcharge, the top four characters read 中國郵政 Chinese Post followed by 50f (5 chiao) Temporary Use. 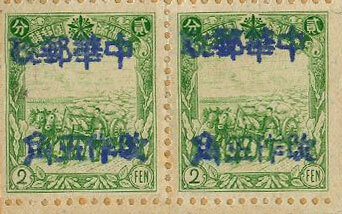 There are also 2f and 4f booklet panes to be found for this set. 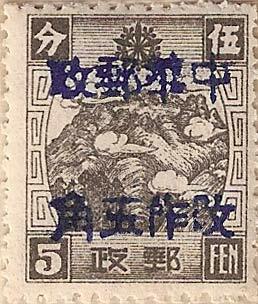 Note: This set also occurs on covers postmarked from Kerr 128 兩江口 Liang-chiang-k’ou although in my opinion based on old collection data is that these stamps originated from the HO Lo Post Office. 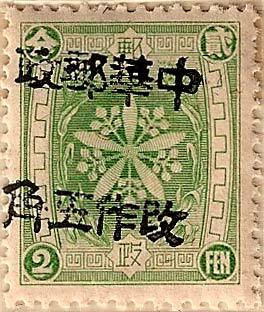 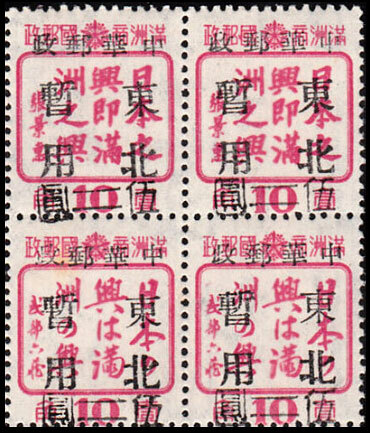 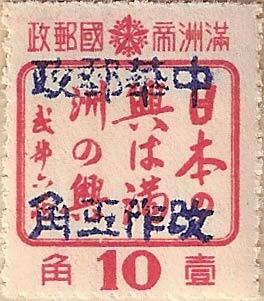 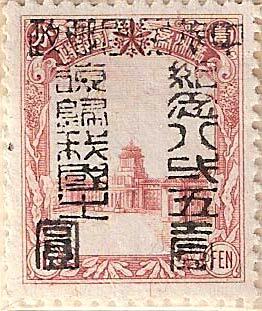 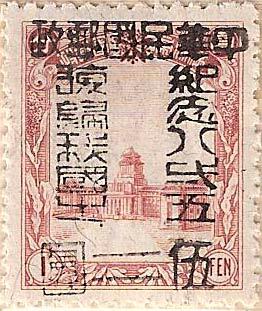 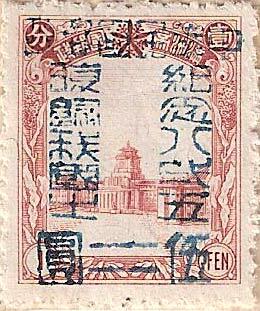 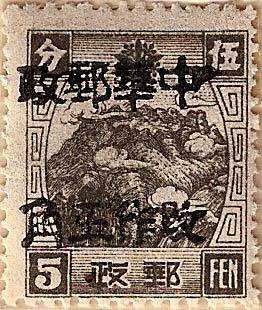 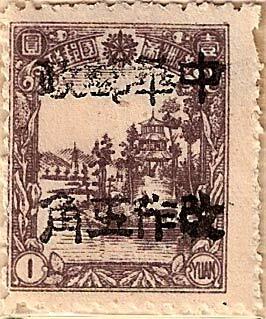 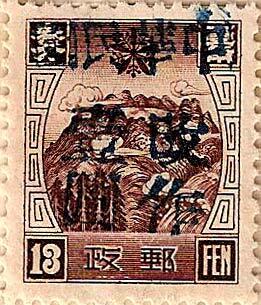 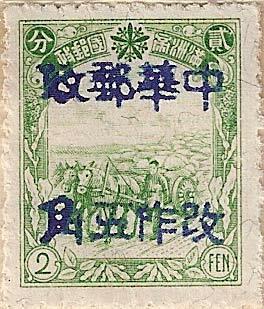 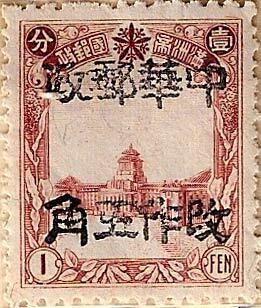 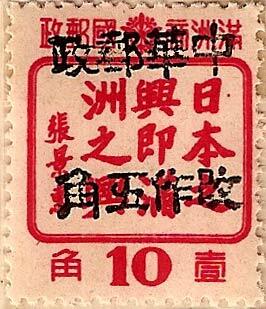 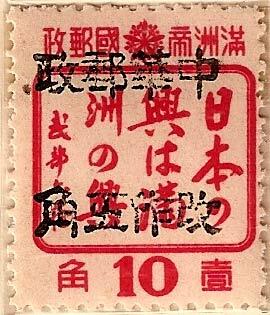 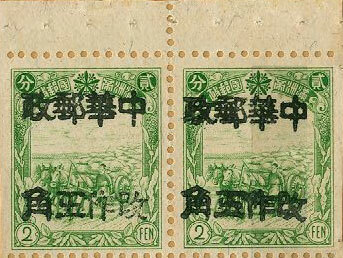 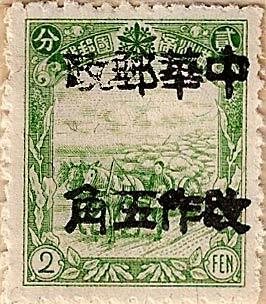 Surcharge added to a stamp already carrying a Chang Chun overprint. 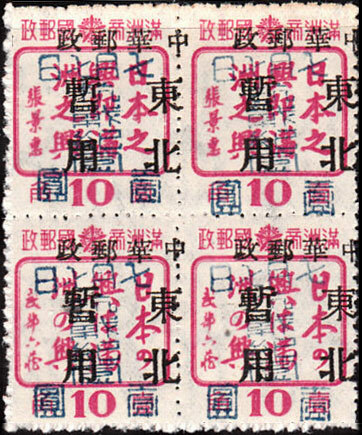 The set contains 4 values, and is repeated in further set of grey blue. 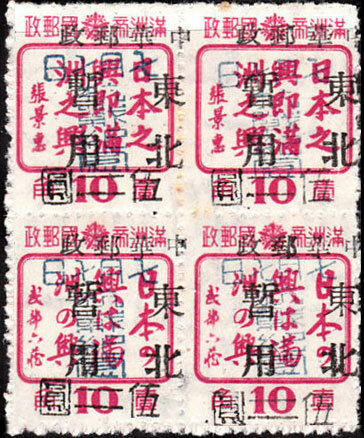 This is a complicated 7. 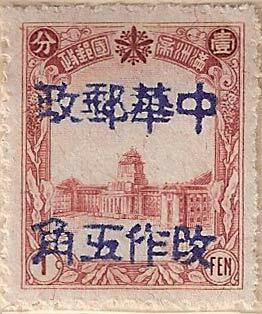 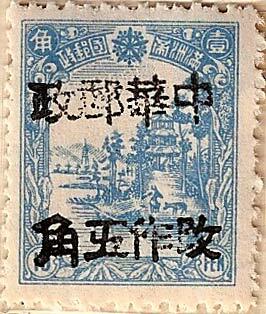 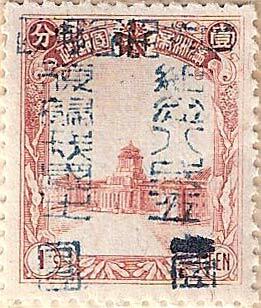 7. commemorative chop in blue, over previously surcharged Chang Chun overprinted stamps. 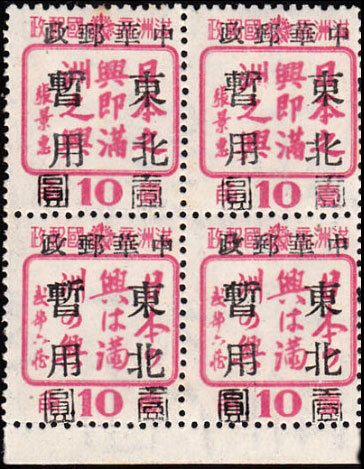 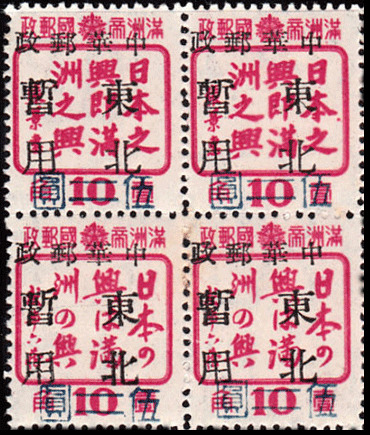 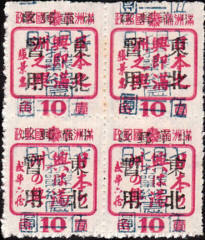 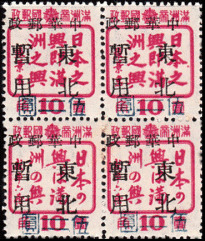 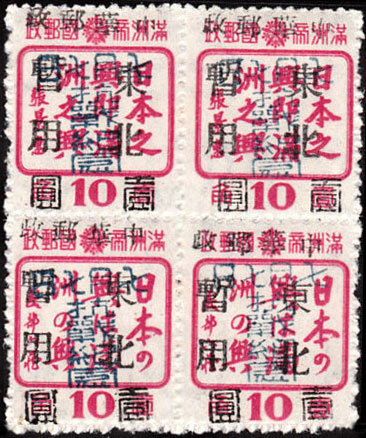 The set consists of eight different overprinted stamps. 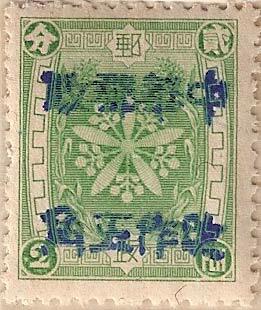 Both of the above examples have slightly misplaced Chang Chun overprints. 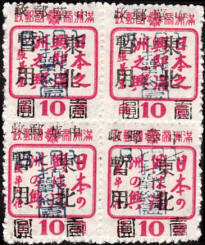 This is a commemorative overprint and surcharge. 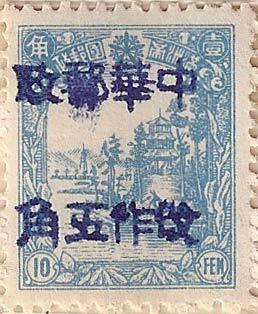 It occurs in black and blue. 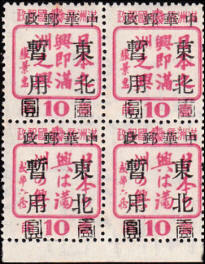 Each colour is a complete set of 2. 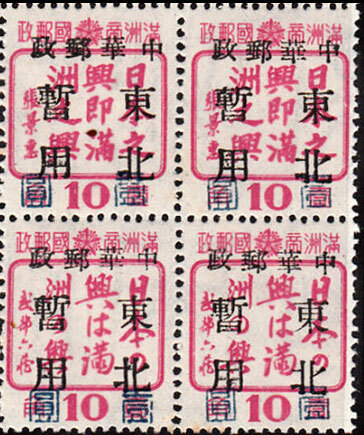 This is a set of 2 surcharges, both with hard blue/black overprints. 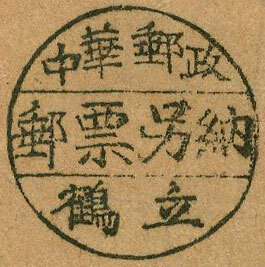 The upper four characters read 中華民國 Chinese Republic.